This flavor-packed marinade simply makes for the most delicious grilled vegetables ever, in my best sub ever. 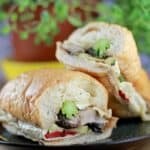 Serve these Spicy Grilled Veggie Hoagies sandwiches up in a buttery toasty bun and take this hoagie wherever your summer takes you. So get ready to fall in love! Because this marinade is fantastic. Combine the ingredients for the marinade. Coat the veggies and let them marinate 15-30 minutes. Spread the insides of the split hoagie rolls generously with butter. Prepare your grill with your highest heat. Grill the vegetables until well scored and slightly softened, but not near mushy. Open the buttered hoagie rolls and place, cut side down, to melt the butter and toast the bread. Remove all from the heat. Once the veggies cool, press gently between paper towels to soak up excess moisture that will otherwise go right into the bread and make it soggy. To assemble: layer mayonnaise, 2 slices cheese, veggies, and 2 more slices cheese in your hoagie. Immediately, wrap the sandwich up with foil and pack for transport. Serve with more El Yucateco® Green Habanero Sauce. I used an egg-free, vegan mayonnaise. So, I didn't have to refrigerate my hoagies because Salmonella wasn't a concern.